Love how the snow "dressed up" the tree - nicely captured! Wonderful, wonderful light on this majestic tree, beautiful capture. I love that tree too! Its beautiful and I have been loving your deer shots...keep them coming! Hi Sharkbayte, I love this tree also and it's such a contrast to the straight lines of the other trees. I know what you mean about photography rules, when there is wildlife around its an adrenaline rush! You are so right about being with nature being so uplifting and beautiful. I am so glad you have found this hobby. I discovered photography when I had been bed ridden for 5 months because of major back problems, and one day I just started using my camera outside, then I got some strength back and started walking. That was 10 years ago. Now another obstacle, chemo damage to the legs, [of all things to happen, to a wildlife photographer! wahh! But I am trying to get back the legs and doing ok, a ton of effort tho... I rigged up a stroller for all my gear so I don't have to carry it]. There are helpful gadgets out there! I wish you the best year ever, and will be thinking of you! You've done a beautiful job for a beginner! 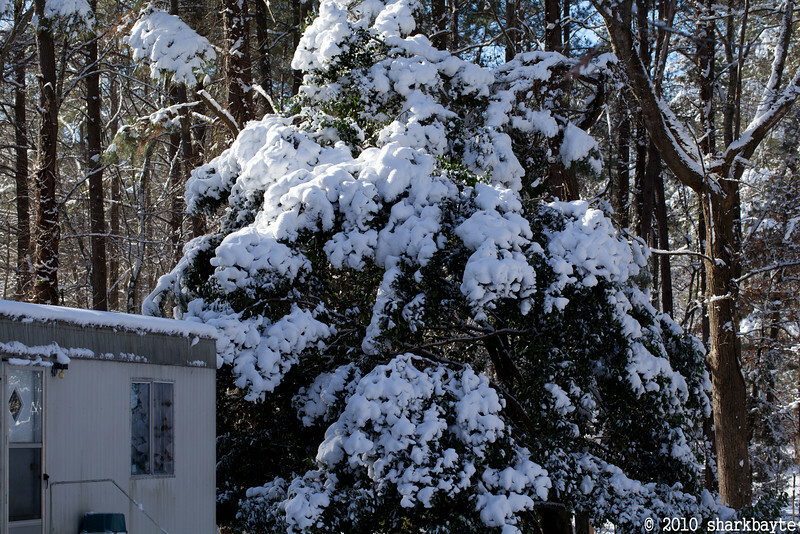 WOW - it looks like the weight of the world in snow is on that tree. Great shot!